My husband and my son both love playing video games. So we are always looking for video games for kids and adults to play together. Ubisoft’s Starlink: Battle for Atlas is a fun, engaging, open-world adventure that is perfect for space explorers of all ages. This is a sponsored post for MomSelect on behalf of Ubisoft. All opinions are 100% mine. It happens pretty often. After soccer practice, dinner, homework and showers, my husband and son disappear. A couple of minutes later, I hear sounds the telltale sounds coming from the game room upstairs and I know they are at it again. They are off to save the world together, win the big football game or beat the bad guys. My husband has grown up with video games. So, now that we are parents, it is fun for him to be able to play games with his son. Unfortunately, as my husband has gotten more and more mature, many titles have as well. This means that we both worry that some titles are a little too mature for our 9-year-old. Now that our son is getting a little older, finding the best video games for kids has become a little more challenging. When he was young, it was simpler. There were a ton of innocent easy titles to keep him entertained. But now that he is older, he is looking for more challenging and engaging games. A lot of the recent popular video games out right now have content we aren’t completely comfortable with. So, we have been on the lookout for that perfect game that is fun and complex, but not too “adult”. Ubisoft has provided that with one of the best video games of 2018 that both adults and kids can enjoy. Starlink: Battle for Atlas is a space-based action-adventure game. You can customize your spaceship and your pilots to explore and battle in a huge open-world environment. We have been playing this game in our house for about a week and my husband and son have been having an absolute blast with it. 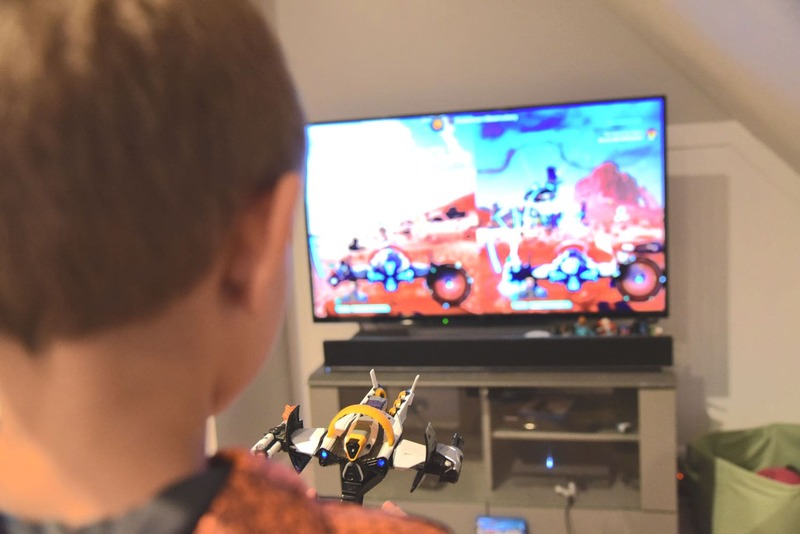 My husband says that there are a number of reasons that Starlink: Battle for Atlas has been such a big hit in our game room this past week. First of all, the way that you can customize your ship has a really cool twist. Instead of your ships existing only in digital form, you can actually buy the physical, modular components and build them in real life. These are sold as, basically, toys that can be mixed and matched and then attached to your controller. Once attached, they change the appearance and abilities of your fighting in the game instantly. 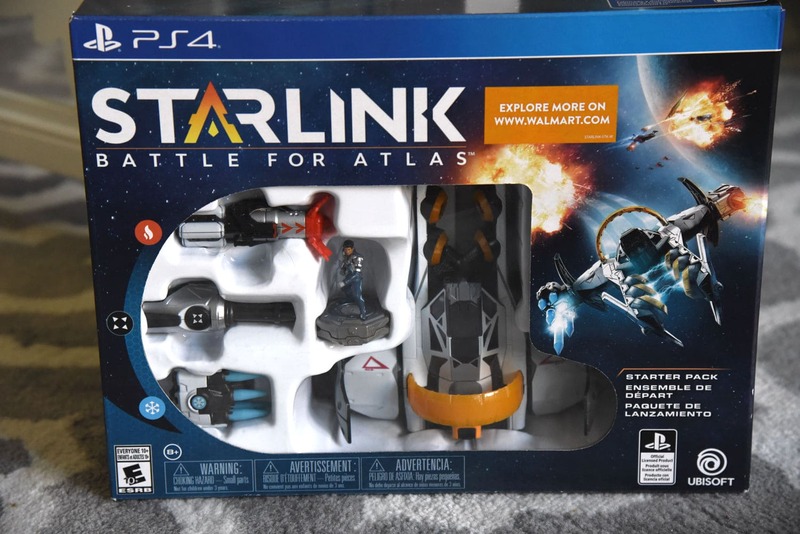 We got the Starlink: Battle for Atlas Starter Pack ($74.99) which comes with one ship, one pilot and three weapons. In total, there are 9 pilots, 5 ships and 15 different weapons that are available to use in the game. All of these have their own strengths and abilities and these combinations can be mixed and matched at will. Theoretically, this would make for endless fun and invention. My son is very imaginative and LOVES to create things, so this would be perfect for him. Unfortunately, all the other ships, pilots and weapons are sold separately. There is no way to “earn” them in the game. At a starting point $75, we are a little disappointed that we only have a fraction of the possible characters and items to play within the game. You can buy the other components in physical or digital form. You can purchase these online or from participating retailers at prices ranging from $7.99-$24.99. The toys themselves look great and are well made. 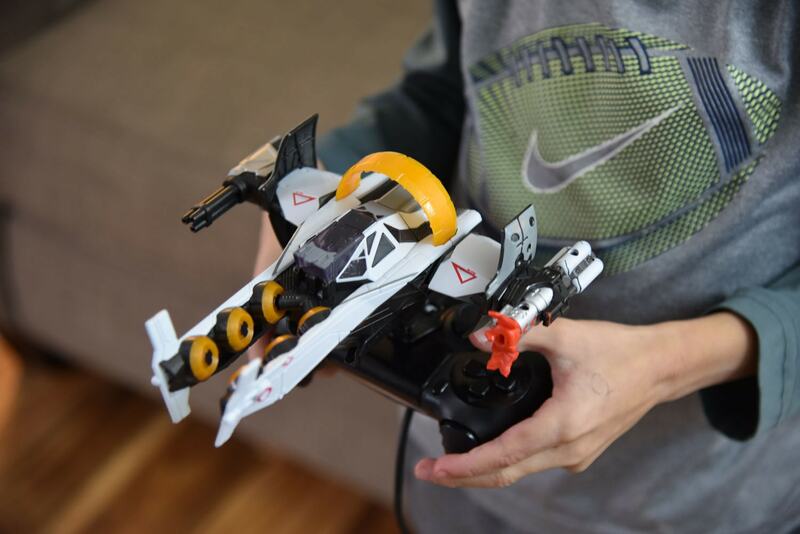 It is really neat that my son can build his own spaceship and have that instantly transported into the Starlink game. In practice, my husband noted that actually physically changing out the weapons during the gameplay was a little cumbersome. Luckily, Ubisoft enables you to play the game in a strictly digital mode if you choose. You can switch ships, weapons, and pilots with the in-game settings in the traditional way. There is actually no need at all to use the toys and after the initial novelty of them wore off, the physical components were mostly left on our entertainment center. My husband told me that what really made this the best video game of this year for kids and adults to play together is the split screen local co-op feature. Starlink: Battle for Atlas is comprised of a vast, rich galaxy with seven unique planets. Each planet has its own ecosystem, creatures, and secrets to explore. You can really go wherever you want, whenever you want. It is rare to find an open world game that is so complex but still kid-friendly. 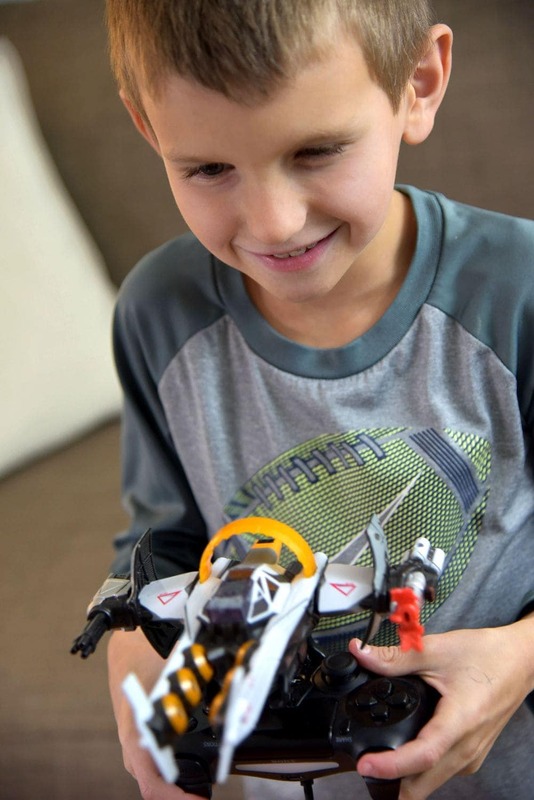 It has a depth and level of detail that can keep my husband’s attention without having to worry about our son being exposed to something he isn’t ready for. The result is that they can have an endless amount of adventure and fun while working together. But, as mentioned above, we only got one ship, one pilot and three weapons with the starter pack. So this means that he and my son have to play co-op as the same ship/pilot/weapons. It would be a lot more fun if they could play with different items and abilities, but unfortunately, it would cost more money. Otherwise, they really love playing together. The controls of the ships are wonderfully designed and everything is very intuitive. The travel between worlds is seamless. You can literally be skimming along the ground of one planet, then zoom into space, dodge an asteroid field, and descend into another planet. The world around you changes depending on choices you make and continues to evolve even when you aren’t playing! The visuals are simply stunning and Ubisoft has done a spectacular job in immersing the player into their world. If you are looking for 2 player video games for kids, this a fantastic option. For me, the bottom line is pretty clear. My two boys have been really enjoying their time together this past week playing this game. I’ve heard lots of joyous sounds coming from our game room upstairs. So I can say this for sure: this is a very fun video game for kids and adults to play together. My husband has admitted to me that he probably would not play this game by himself much. (Although I caught him last night doing exactly that!) While the world is vast, the game does get a bit repetitive. There missions to collect things and missions to protect things. There are missions to rescue things. He has to defeat bosses. He has been playing video games for over 30 years and has seen all of this before. My husband says that he LOVES playing this with our 9-year-old son. It really is the perfect game for a child around that age who have outgrown the “kiddy” games but isn’t quite ready for the older teen titles. Starlink: Battle for Atlas promotes imagination and problem-solving in an adventure filled story that is funny engaging. 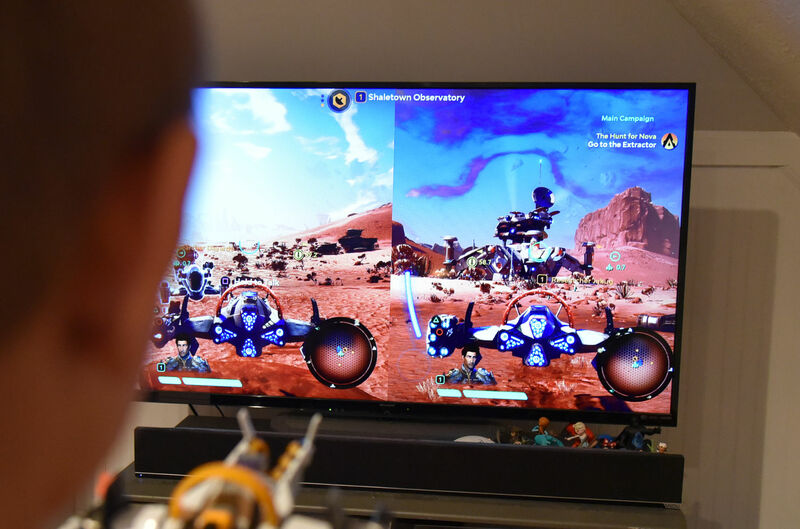 We play Starlink: Battle for Atlas on our Play Station 4. But it is also available for the Xbox One and Nintendo Switch. For fans of the popular Star Fox games on Nintendo, I’d recommend getting the Switch version. This would come with the famous pilot Fox McCloud, his Arwing starship and exclusive Star Fox missions. Starlink: Battle for Atlas is available now and would make a great Christmas present this year for a child between the ages of 7 and 12. I can see my husband and son sitting in their pajamas Christmas Day, telling me they just need to complete one more mission.